With the growth of our township, traffic has increased and the need for dealing with this is always present. The police department is also concerned about this. We are developing plans to assist you in reporting and addressing issues of concern in your neighborhood. We have a couple of ways to assist you now. We have a specially designed trailer equipped with radar and a lighted sign. This trailer shows drivers what their speed is as they approach the trailer. It also has the ability to capture data as to time and speed of any vehicle that approaches this trailer. This is a great tool for us and one that you can utilize to address speeding issues in your neighborhood. For further information on the speed trailer and/ or how to get one set up in your neighborhood please contact Officer Dan Krajicek at 419-882-7878. 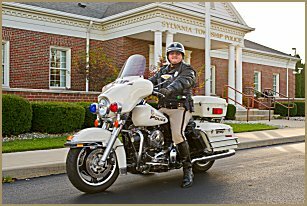 If you would like to have more patrol in your neighborhood due to concerns about speed and safety, or other traffic related issues, please contact, Lt. Austin at 419-720-3001. He will work with you on the issues and help with additional patrols in your neighborhood, if that is what is needed. What time of day does it occur? What day or days of the week does it occur? Any other information about the issue that will help us. As part of our community policing effort, we like to hear from you about your concern(s). As part of this effort we offer neighborhood meetings. These can be held at one of your homes, businesses, a township facility, or anywhere else that is able to hold a meeting of this type. The purpose of these meetings is to gather information from you about your concerns and then cooperatively come up with ways to help. It would also allow us to be creative with other ways to address the concern(s) that may involve other departments, such as our road department. We are available for mutually convenient times and places, during the day, night or weekend. If you would like further information, please contact our community affairs officers at 419-882-7878.